A lot of relevant stuff I know, but to analyze it even better, I thought of doing a breakup, month-wise and then analyzing different publishers with the different audience to see what are they covering. I start with August as this is when we started large-scale crawling of the web apart from important news sources for which we have crawled going long back. Highlights this month were: Zuckerberg demoed his Home AI assistant, Jarvis. Virtual Assistants and Self-Driving Cars are the two most established AI use cases without a doubt. Most of the digital web is about different companies which you see as keywords. A lot of keywords point towards AI techniques (supervised/unsupervised/ reinforcement / predictive analytics/ deep neural networks). AI partnership formed between big 5 (Google, Microsoft, Facebook, Amazon, and IBM) to advance public understanding of the sector. Intel acquiring Nervana and Movidius. Westworld, which is what I think is the new “Terminator” or pop description of AI. Deepmind’s Wavenet paper which can generate very humanlike sounds. Bots, banking, and autonomous vehicles, which are areas most disruption ready through AI. President Obama talking about AI was one of the biggest events this month. You have typical repeating terms like Deepmind, Facebook, Tensorflow etc. November was the start of a battle for AI on the cloud. Google, Amazon, and Microsoft started coming up with their services. Also, it was the month of US elections and how AI is being used in elections (esp. Clinton campaign) was a topic of discussion. Elon Musk’s apprehensions about AI were talked about too. Different companies coming up with different innovations in AI actually crowd the keywords (examples are Uber, Stich Fix, h20 acquisition) along with applications (healthcare, autonomous vehicles, robotics, vision). Open AI and Google launching their own reinforcement learning frameworks are also in news. Google’s massive neural machine translation breakthrough seems to be the most important of all. The rest of the keywords are our usual suspects. AI had some landmark events happening this month. An AI algorithm got better than humans at playing poker, another actually could get better than doctors than guessing skin cancer. Also, the regular keywords like virtual assistants and autonomous vehicles continue. Microsoft launched its groundbreaking new technology on speech recognition. Argo AI’s $1billion funding from Ford and other self-driving car news seem to most talked about. Uber AI people predicted self-driving cars would deliver Pizza pretty soon. What we did in parallel was to choose some publishers and come up with different sources which are catering to different audiences and try to find out what they are talking about. The sources we analyzed are Business Standard, Computer World, PC World, Hackernews, Techcrunch and Forbes. Business Standard is writing for generic Indian business audience and hence talks about automation, investment, services and solutions in AI. Computer World is talking to computerphiles and hobbyists and hence talks about all the major events that we see coming up in the month-by-month analysis. Cyber security seems to be one use case of AI application that enthusiasts see, but it gets slightly marginalized in coverage when looking at the big picture of AI. PC World is trying to cater to a more hardware oriented audience and talks about the hardware required for AI. Check out the keywords and you might find something new in AI hardware space. I can most relate to the keywords our algorithm finds here (not surprisingly, I am a regular HN lurker). Software frameworks, libraries, algorithms, tips and tricks. This makes me feel like doing a similar analysis on Arxiv and /r/ml where I am even more active. Techcrunch keywords clearly indicate the type of audience and its catering to startup enthusiasts. 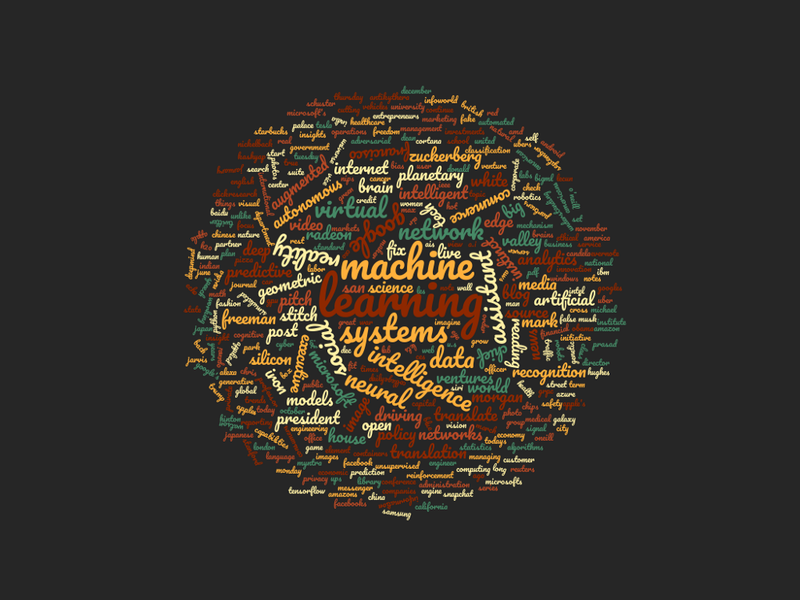 Check out the keywords to see what are the topics which are being discussed about AI startups. Forbes, just like a business standard, seems to be talking of bigger picture so that the business readers can understand what is going on in AI. Want to improve your SEO. Click here to schedule a free demo.